Ride across the icy cold Hoth with this adult tauntaun costume! 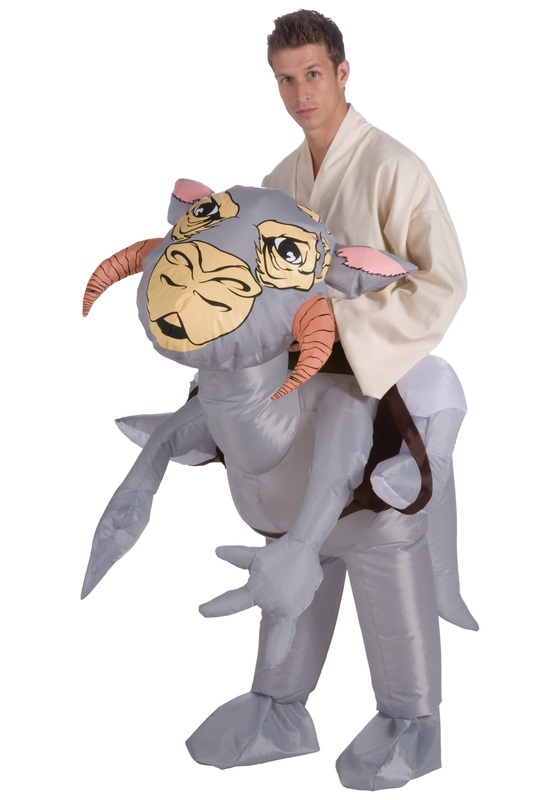 This adult size inflatable taun taun costume includes a gray polyester taun taun piece that fits around the waist with an adjustable drawstring. Your legs fit through the tauntaun legs and elastic bands keep them in place. A small hole fits the fan mechanism, which inflates the costume with a battery operated fan (instructions are included). 4 AA batteries (not included) fit into the power pack, which attaches to your clothing. When inflated, the costume recreates a taun taun, with the classic tan face features on the head, two horns poking out of the sides of the head and a pair of perky ears. A tail pokes out in back and two little arms poke out in front. Little inflatable legs fit into the brown stirrups along the side. Complete your Star Wars costume with this inflatable tauntaun!